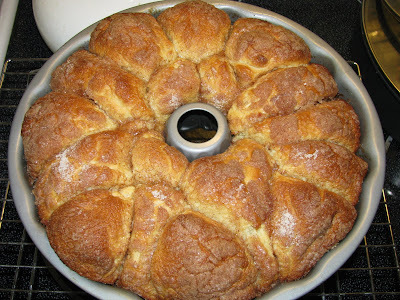 The Neon Celery Kitchen: Golden Bubble Bread--the Ancestor of "Monkey Bread"
Golden Bubble Bread--the Ancestor of "Monkey Bread"
I've been on baking hiatus for a while. As a matter of fact, I've been on kitchen hiatus for a while. At first, it was because I was newly pregnant and exhausted, and had very little interest in food unless it was very unhealthy and served to me (oh, yes, this otherwise-veggie-loving girl was all about the burgers and chicken fingers and fries). But, then, an odd thing started happening. I would try a new recipe for dinner, and it would flop. We're talking "throw it away and order pizza instead" flop. Seemed that the growing fetus was feeding on my kitchen mojo. I guess it will be worth it, once we have a child. But, in the meantime, it has been somewhat frustrating. I took the day off from work today so that Kurt could get his car looked at. I decided to attempt to bake bread again. Risky, I know. But, I guess, if I didn't start trying again, then I would never go back to being the baking diva that I used to be. The recipe I chose was "Golden Bubble Ring," from a really old cookbook. It's from the Better Homes and Gardens Bread Cook Book," originally published in 1963. The back says, no joke, "360 exciting ways to let your hospitality show!" Now, why they couldn't add in another five recipes so that we had one for every day of the year, I do not know. But, I can tell you that I simply love the pre-feminist ways the book addresses the reader. There's just something that makes me happy about "Let your talents show when you serve a colorful and refreshing fruit plate accompanied with oven-fresh Puff Pillow Buns...For a beverage serve tall glasses of pink lemonade." It's just so...quaint. Okay, back to the bread that I made today. Lately, it seems that "monkey bread" is all the rage. You know the stuff--it's all over the internet. 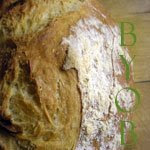 You break up pieces of refrigerated biscuit dough and roll them in butter and cinnamon/sugar to make a pull-apart bread. This bread is that trend's ancestor. Same idea--pull-apart cinnamon bread. Except that you use yeast. And it takes four hours to make...if you're good...and don't have to pick up a car in the middle of one of the rises...and don't get interrupted by a call from a rabbi who wants to give you the name of the mohel you asked for, and to also woo you so that you join his congregation. My total was five hours, because of all of the above. But, oh boy, were those five hours worth it! This bread turned out fabulous. Meltingly rich crumb, and strong, comforting cinnamon flavor. It was quite a treat...even at 6 at night, instead of for breakfast. It seems that this recipe restored my baking mojo. Maybe it's just that the recipe was written in 1963, and was therefore directed toward my current "barefoot, pregnant, and in the kitchen" state. (Yes, I was barefoot--how cliche of me.). Whatever the reason, I'm glad to be back to baking. Oh, and here's the recipe. It's worth picking up the book, if you can find it at a used bookstore or garage sale, though. The kitsch factor alone is worth it. Soften active dry yeast in warm water. Combine milk, 1/2 cup sugar, and salt. Add 1 cup flour; beat well. Add yeast mixture and eggs. Beat smooth. Mix in remaining flour, or enough to make a soft dough. Knead on lightly floured surface until smooth and elastic (8 to 10 minutes--about 6 minutes in my Kitchenaid). Place in greased bowl, turning once to grease surface. Cover; let rise in warm place until double (1 to 1 1/4 hours). Punch down. Cover; let rest 10 minutes. Shape into about 28 balls, golf-ball size. Roll each in melted butter, then in mixture of 3/4 cup sugar and cinnamon. Arrange in well-greased 9-inch tube pan (I used my Bundt pan). Sprinkle with any remaining sugar mixture. let rise in warm place until double (about 1 hour). Bake in moderate oven (350 degrees) about 35 to 40 minutes. Cool in pan 15 to 20 minutes. Invert on rack. Eat.